Many people don't know how to recycle gold from computer motherboards. Gold is a high precious metal valuable and used in many different types of electronic equipment, especially motherboard computers. With the price of gold being at an all time high, there are now numerous companies who are recycle the infinitesimally small amounts of gold. Most of the gold is found in the motherboards. 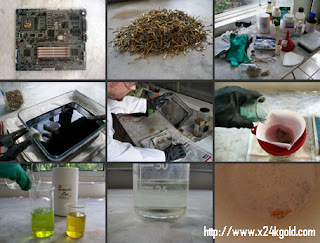 Here’s a process of recycle gold from motherboards. Gold is found in numerous places on a motherboard: IDE connectors, PCI Express slot, PCI, AGP, ISA, and other ports, jumper pins, the processor socket, and DIMM (SIMM on older motherboards) slots.All of these connectors are often covered with a fine layer of gold a few microns thick, deposited by flashing or plating. 2. To recycling the few micrograms of gold deposited on the pins, we’re going to use an electrolytic cell. The bath consists of a 95% solution of sulfuric acid. The cathode is lead and the anode is copper. The pins are placed in the copper anode, which we’ve formed into a basket shape. 3. By running an electrical current through the cell, using an ordinary battery charger, the copper in the anode (and in the pins) dissolves and is deposited on the lead cathode. The gold, detached from the copper, forms a sediment at the bottom of the cell. Also note that the temperature of the bath increases significantly during this process. 4. Once all of the gold has detached from the pins, the bath is allowed to settle. Then, we recover as much of the sulfuric acid as possible, before diluting what remains in the bottom of the electrolytic cell. 5.We end up with a diluted solution of sulfuric acid, various metals (including gold), and waste that then needs to be filtered. Why not just filter the solution directly, without diluting it? Because paper filters don't stand up well to strongly concentrated sulfuric acid. That's why. 6. What remains in the filter is a mixture of various metals and impurities. We now dissolve everything in a mixture of hydrochloric acid at and chlorine bleach (sodium hypochlorite), in a proportion of 2 to 1. 7. To got the metallic gold, we now need to precipitate the gold that’s in solution. For that, we use powdered sodium metabisulfite. In the presence of water, the sodium metabisulfite produces sodium bisulfite.This sodium bisulfite is what will allow the gold to precipitate. 8. Now, all we need to do is to melt the gold powder in a crucible. The melting point of gold is around 1064° C (1947.52 °F), so an oxy-butane torch will do the job.